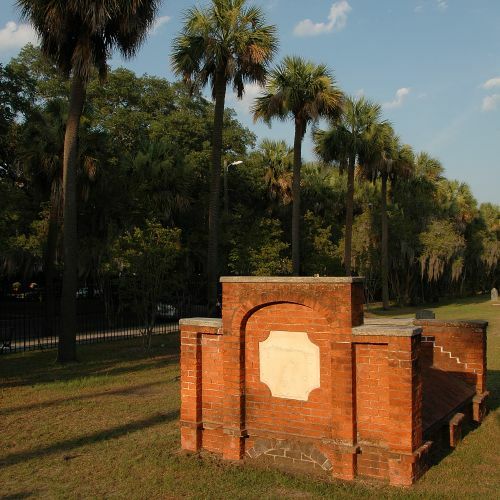 One of the most beautiful and serene public spaces in Savannah, Colonial Park is a veritable museum of the history of early Georgia. While just over 600 graves are marked, the cemetery is reputed to have been the site of as many as 10,000 burials. 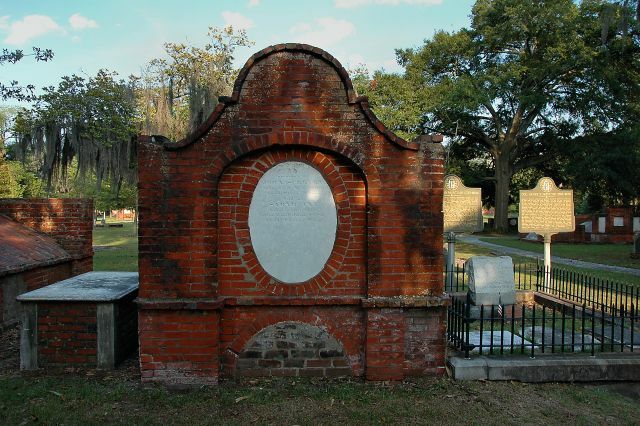 It’s the second oldest cemetery in Savannah, established circa 1750 as the burying ground for Christ Church parish. 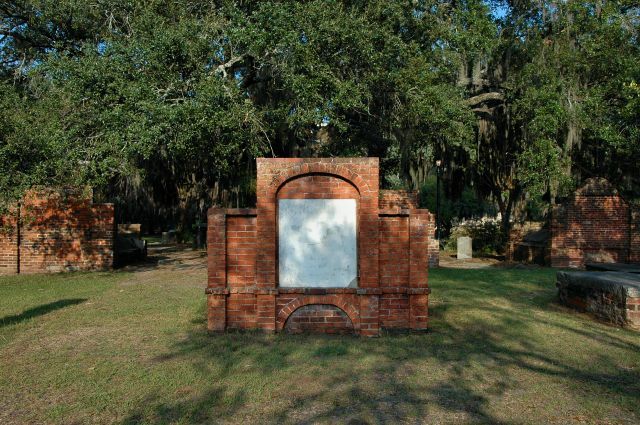 It was enlarged in 1789 to allow burials of people from all faiths and it was closed to burials in 1853. 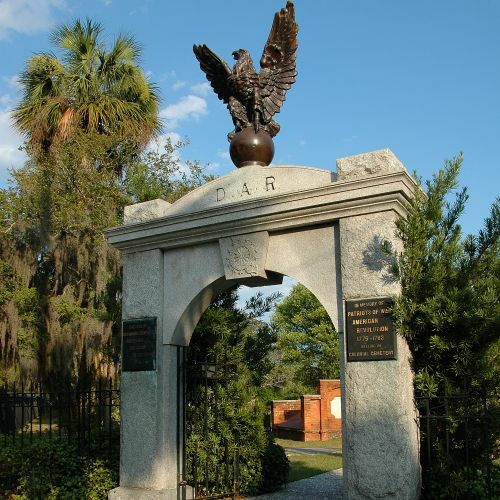 This monumental arch was erected by the Daughters of the American Revolution to memorialize the Revolutionary War veterans buried in Colonial Park Cemetery. This scene is near the modern entrance to the cemetery. Early 20th century postcards identify this lane of trees as the Avenue of Palmettos. They were apparently planted in the late 19th century, as they appear quite small in those images. 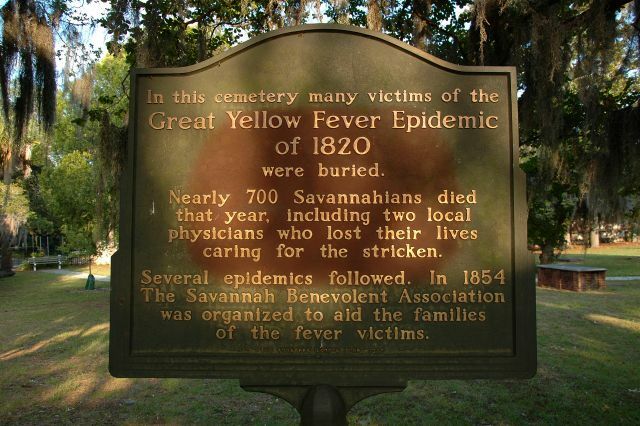 Though its pathology was unknown at the time, the Great Yellow Fever Epidemic which plagued Savannah throughout 1820 claimed over 700 lives, including two physicians who attempted to treat the afflicted. Several similar epidemics would follow. 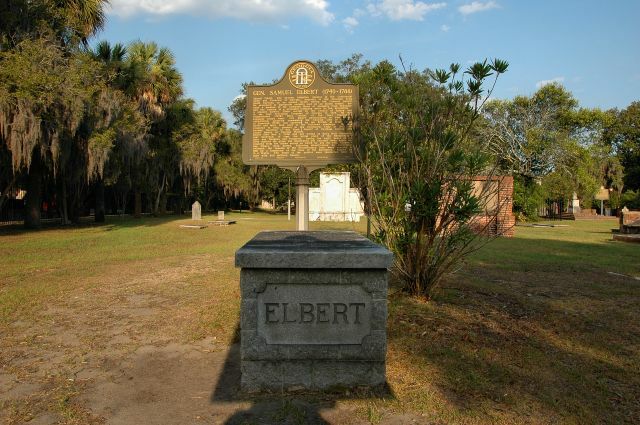 Samuel Elbert (1740–1 November 1788) , who migrated to Georgia from South Carolina, served on the Council of Safety and the first Provincial Congress of Georgia in 1775. He was Lieutenant Colonel of the first Continental regiment raised in Georgia, commanded the Georgia Line at the fall of Savannah in 1778, was captured by the British at Briar Creek in 1779, and later took part in the Battle of Yorktown. After his promotion to Brigadier General in the Continental Army in 1783, he served as Governor of Georgia, Sheriff of Chatham County, and Grand Master of Georgia Masons. 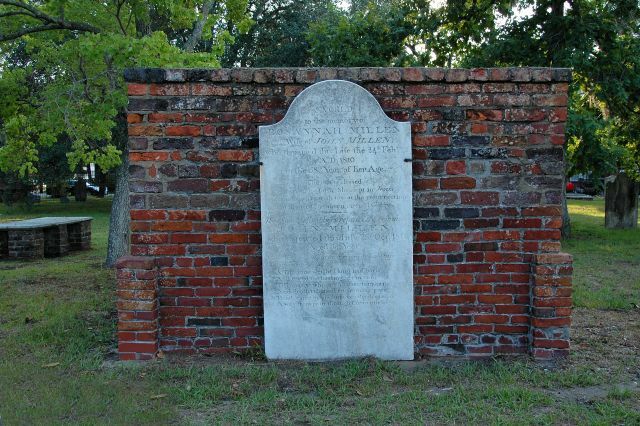 James Habersham (1712?–28 August 1775) was one of the most prominent merchants and public servants of the Colonial Era in Georgia. Soon after his arrival in the colony in 1738, he helped establish, with Reverend George Whitefield, the Bethesda Orphanage. 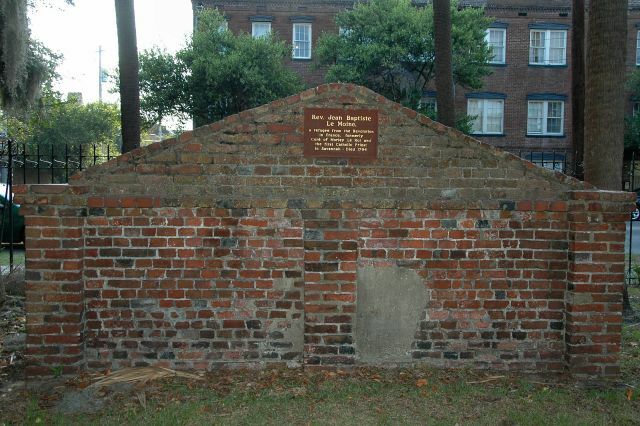 By the 1740s he had established the most successful commercial enterprise in Savannah; his many posts included Provincial Secretary, President of His Majesty’s Council for Georgia, and Acting Provincial Governor from 1771 until 1773. Though he was opposed to the oppressive acts of Parliament, he remained a fierce Loyalist. His loyalties, though, did not tarnish the universal respect held for him by his fellow Georgians. He died visiting New Jersey. James Habersham, Jr. (1745-2 July 1799) was a founding Trustee of the University of Georgia. Joseph Habersham (28 July 1751-17 November 1815) was an ardent Son of Liberty and member of the Council of Safety. In 1775 he took part in the raid on the King’s powder magazine and in 1776 personally affected the arrest of Sir James Wright, the Royal Governor. He later served as Mayor of Savannah, and Postmaster General of the United States, from 1793 until 1801. John Habersham (23 December 1754-17 December 1799) was twice taken prisoner during the Revolutionary War. A member of the Continental Congress in 1785, he later served as a Commissioner of the convention that established the Georgia-South Carolina Border, and first Collector of Customs at Savannah. General Lachlan McIntosh (17 March 1725–20 February 1826) , whose father John Mor Mackintosh founded the seaport town of Darien, was Georgia’s most illustrious officer in the American Revolution. Commissioned Colonel of the first Continental regiment raised in Georgia, General McIntosh was transferred to General Washington’s headquarters after his duel with Button Gwinnett. Washington later gave him command of the Western Department at Fort Pitt. Returning to Georgia in 1779, General McIntosh took part in the Siege of Savannah. His war service culminated in his capture during the fall of Charlestown (Charleston) in 1780. Colonel James S. McIntosh (1784–1847) was a great-nephew of General Lachlan McIntosh. He was a hero of the War of 1812 and later in life provided gallant service during the Mexican War. He died from wounds suffered at the storming of El Molina del Rey on 8 September 1847. 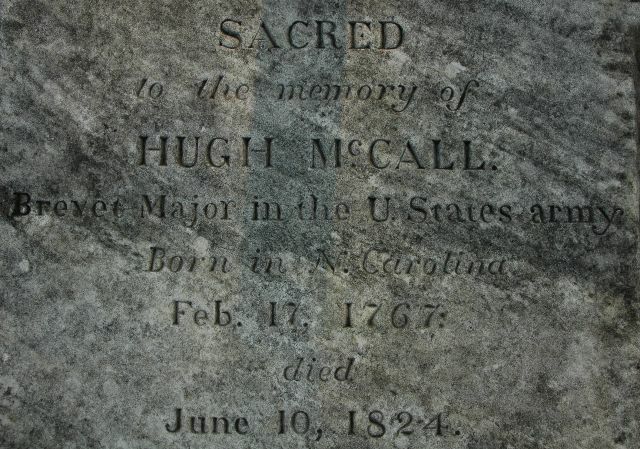 Hugh McCall (17 February 1767–10 June 1824) McCall published the first installment in his History of Georgia at Savannah in 1811. It was the first comprehensive history of Georgia published in America. James Johnston (1738-1808) Johnston, a native of Scotland, came to Savannah in 1761, and was appointed Public Printer of the Province the following year. The first issue of Georgia’s first newspaper, The Georgia Gazette, was brought out by Johnston on 7 April 1763. Johnston was a Loyalist, and after briefly Savannah, he returned when British rule was restored in 1779, resuming publication of the newspaper under the title Royal Georgia Gazette. 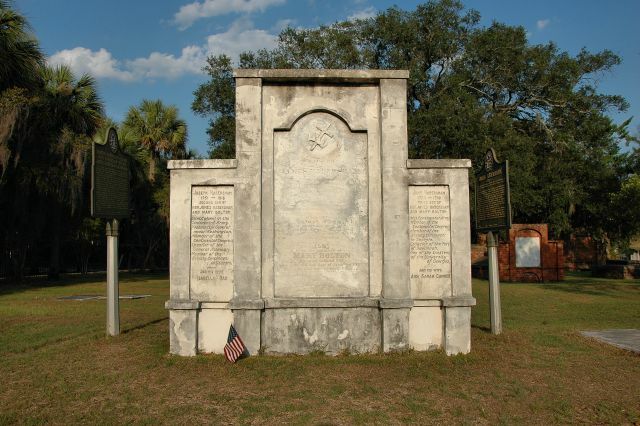 Interestingly, the Patriots allowed his return to Savannah after the war, and the paper was published from 1783 until 1802 as Gazette of the State of Georgia. The Graham Vault For 114 years, the remains of the Revolutionary War hero Major General Nathanael Greene (7 August 1742 – 19 June 1786) and his eldest son, George Washington Greene, were interred here. They were exhumed and re-interred at Johnson Square in 1901. Also entombed here was the British Loyalist Lieutenant Colonel John Maitland of the 71st Regiment of Scotch Foot. 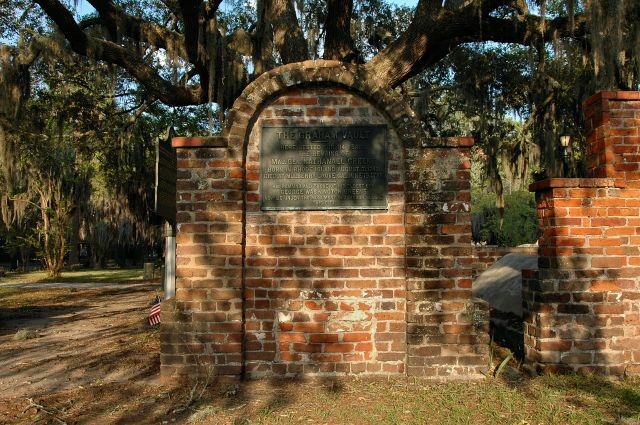 After helping defend Savannah from the French and American forces in 1779, Maitland suddenly died. 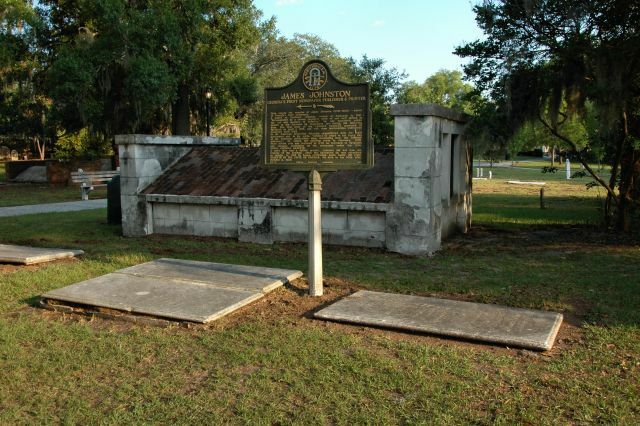 The Royalist Lieutenant Governor of Georgia at this time, John Graham, who owned the plot, allowed Maitland’s entombment here. His remains have also apparently been removed. This is likely the only tomb to have ever held the remains of a hero of the American Revolution, alongside a British Loyalist. 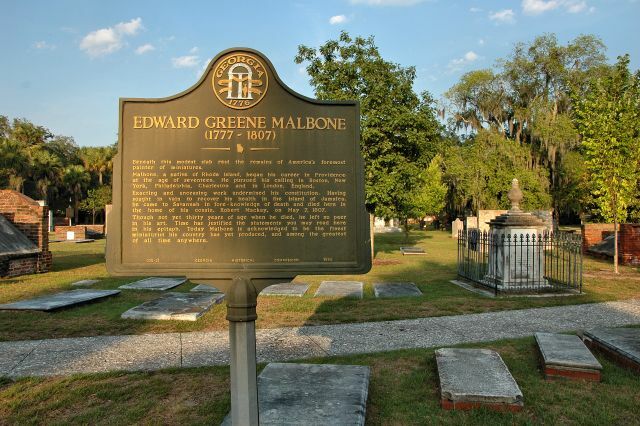 Edward Greene Malbone (August 1777 7 May 1807) Malbone is considered by most art historians to be the greatest of all American miniaturists, and among the best of all time. He died in Savannah while visiting his cousin, Robert Mackay. 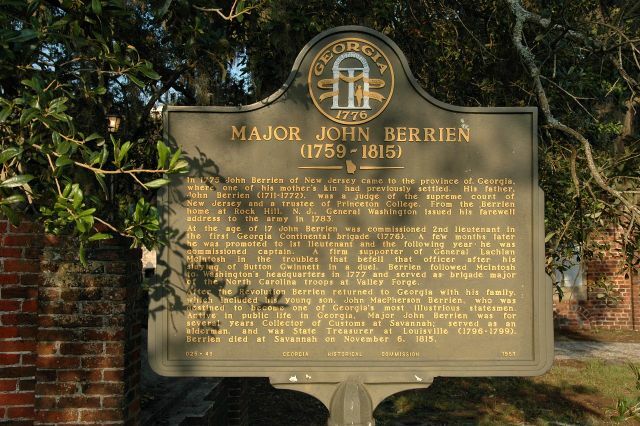 Major John Berrien (1759-6 November 1815) Berrien came to Georgia from New Jersey in 1775, and soon thereafter, at the age of 17, was commissioned 2nd Lieutenant in Georgia’s first Continental Brigade. Within a year, he was promoted to Captain. Berrien was a strong supporter of Lachlan McIntosh and followed him to Valley Forge in 1777, where he served as brigade major of the North Carolina troops stationed there. After the war, he returned to Georgia and was active in the early bureaucracy. His father’s home in Rock Hill, New Jersey, was the scene of General Washington’s farewell address to the army. His son, John McPherson Berrien (1781 – 1856) served Georgia in the United States Senate and was Andrew Jackson’s Attorney General. 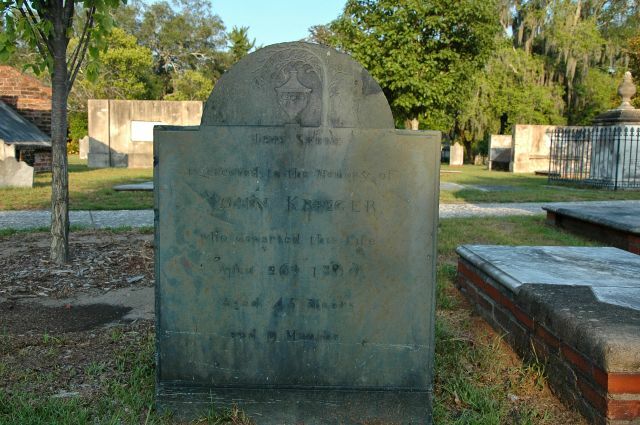 John Kreeger (July 1754–26 April 1800) This is one of the few slate headstones in Colonial Park Cemetery. Reverend Jean Baptiste Le Moine (d. 1794) A refugee of the French Revolution, Reverend Le Moine was formerly the Cure of Morley Le Roi. He was the first Catholic priest in Savannah. Button Gwinnett (1732-35?-19 May 1777), one of Georgia’s Signers of the Declaration of Independence, was also elected to the Continental Congress and President of the Georgia Council of Safety. Though chosen to head the Continental Battalion for Georgia in the Revolutionary War, he was forced to decline the position due to a political rift with his rival, Lachlan McIntosh. Their animosities reached a fever pitch on 16 May 1777 when Gwinnett challenged McIntosh to duel outside Savannah. Though McIntosh survived, Gwinnett died three days later, on 19 May 1777. 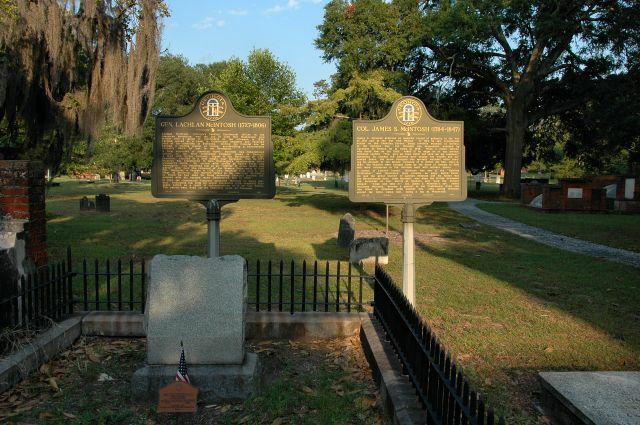 In 1964, the Savannah-Chatham County Historic Site and Monument Commission chose this spot to memorialize Gwinnett. There is great debate among historians of Colonial Georgia as to whether Gwinnett is even buried in this cemetery, though the erection of this memorial was a grand gesture considering Gwinnett’s long controversial reputation. Genuinely enjoyed your pic series of burial sites in Colonial Cemetery and the descriptions of prominent figures in early Georgia history. Been there several times and always learn something new each time. Thanks for sharing your observations of the historic areas of coastal Georgia. Thank you so much for this wonderful history lesson. As a native Savannahian, I grew up with all of this around me and did not take advantage of the history that surrounded me. 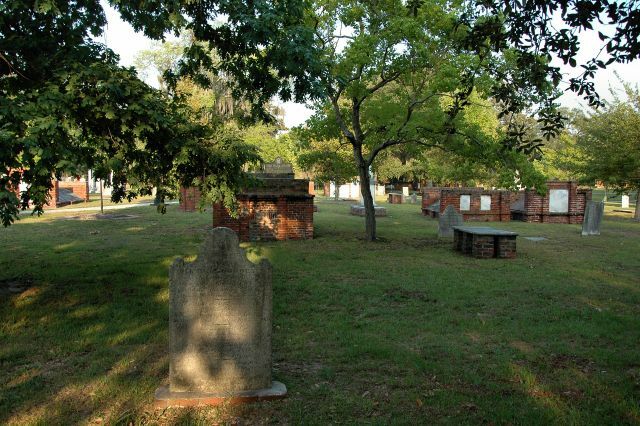 I look forward to my next trip to Savannah and the Colonial Cemetery. The pictures are wonderful.